Boyer R., Freyssenet M., "The World that Changed the Machine. An analysis schema of productive models, La Lettre du GERPISA, february, 2000, n°139, pp 2-4 ; march 2000, n°140, pp 2-6 ; april 2000, n°141, pp 4-7, may 2000, n°142, pp ; June 2000, n° 143, pp. 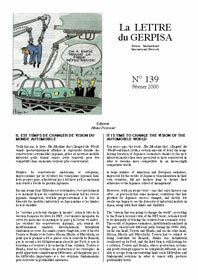 Digital publication, gerpisa.univ-evry.fr, 2001; freyssenet.com, 2006, 200 Ko. The text is downloadable. Please, go to the end of this page. The first publication of this text was in the Lettre of GERPISA, in serial in five consecutive issues : (1) Conditions for profitability"; (2) Profit Sources and Strategies" ; (3) "Competed-Competitive" Income Growth and Distribution Modes. The "diversity and flexibility" profit strategy. The "Taylorian" and Woollardian" models"; (4), Income Growth and Distribution Modes within a Nationally Coordinated and Moderately Hierarchized Distribution, ‘Volume’, ‘Volume and Diversity’ and ‘Permanent Cost Reduction at Constant Volume’ Profit Strategies, the ‘Fordian’, Sloanian’ and ‘Toyotan ‘ Models" ; (5), The National Income Growth and Distribution Modes that were in Favour to ‘Innovation and Flexibility’ Profit Strategy, the ‘Hondian’ Model that Implemened It". The text begins by two essential conditions for carmakers to maintain long lasting profitability, main conclusion of GERPISA works. The first one consists in a pertinent profit strategy with regards to national income growth and distribution modes. The second requires coherence among product policy, productive organization, and employment relationships in light of the adopted profit strategy, thanks to an enterprise government compromise obtained by major actors and relative to the means to be employed. The first is made up of an income growth and distribution mode that we have called "competed-competitive"; the "diversity and flexibility" strategy, the "Taylorian" model, and the "Woollardian" model. The second group is made up of income growth and distribution modes that share the common element of nationally coordinated and moderately hierarchized distribution; profit strategies based on "volume", "volume and diversity", "reducing costs at constant volume", the "Fordian", "Sloanian", and "Toyotan" models. The third group is that of income growth and distribution modes that are regular, however revenue distribution is "competitive"; the "innovation and flexibility" strategy and the "Hondian" model. 4. Income Growth and Distribution Modes within a Nationally Coordinated and Moderately Hierarchized Distribution, ‘Volume’, ‘Volume and Diversity’ and ‘Permanent Cost Reduction at Constant Volume’ Profit Strategies, the ‘Fordian’, Sloanian’ and ‘Toyotian ‘ Models"
5. The national income growth and distribution modes that were in favour to « innovation and flexibility » strategy. The « hondian » model that implemented it. Automobile, car makers, growth mode, profit strategy, productive models, employment relationships, productive organisation, product policy, business history, theory of firm, Fordism, fordian model, Taylorism, taylorian model, sloanian model, Toyotism, Japan, Henry Ford, Alfred Sloan, General Motors, Ford Motor Company, F.W. Taylor, Chrysler, mass production, commonalisation, economies of scale, variety, cost reduction, innovation, flexibility, labour, market. Economics, Management, History, History of Sciences and of Technologies, Sociology. 2006.05.09, Boyer R., Freyssenet M., "The World that Changed the Machine, La Lettre du GERPISA, february, 2000, n°139, pp 2-4 ; march 2000, n°140, pp 2-6 ; april 2000, n°141, pp 4-7, may 2000, n°142, pp ; June 2000, n° 143, pp.